Whenever any player dies, Hua Tuo immediately dies. Otherwise Hua Tuo cannot be killed. During his turn, Hua Tuo can discard X to let anyone recover X blood. 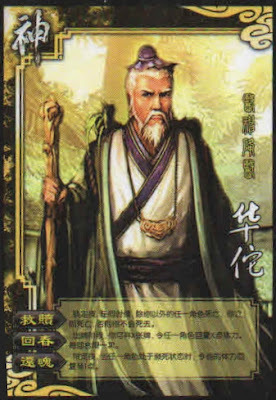 If Hua Tuo is face up, he can save anyone on the brink of death by flipping his card. The person he saved returns to half their maximum health rounded down. 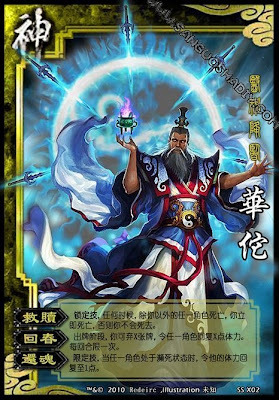 Hua Tuo has zero health, so he cannot hold on to any cards after his turn. If he is chosen as the king, Hua Tuo will have 1 blood. When he loses it nothing will happen though. If Hua Tuo is already face down, he cannot save anyone.